FDM4 WMS’s receiving process is simple, intuitive and entirely RF-driven and the ERP is notified in real-time. Bar code labels may be printed for products that need them. Receiving process results may be audited using the report facilities. For non-standard situations, FDM4 WMS handles non-stock items, substitutes and supersedes. Non-PO receipts are supported. Lot numbers and serial numbers are captured when needed. When desired, RF screens support inquiry into the contents of any receiving pallet. Material may be transferred from one pallet to another as needed. 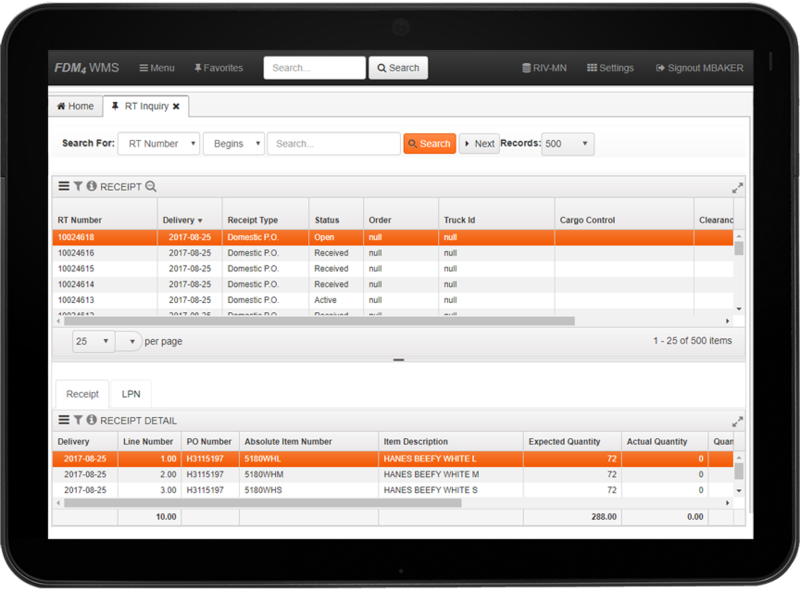 At receipt, FDM4 Warehouse Logistics can determine the parameters in which to sample a shipment to assure significant quality. 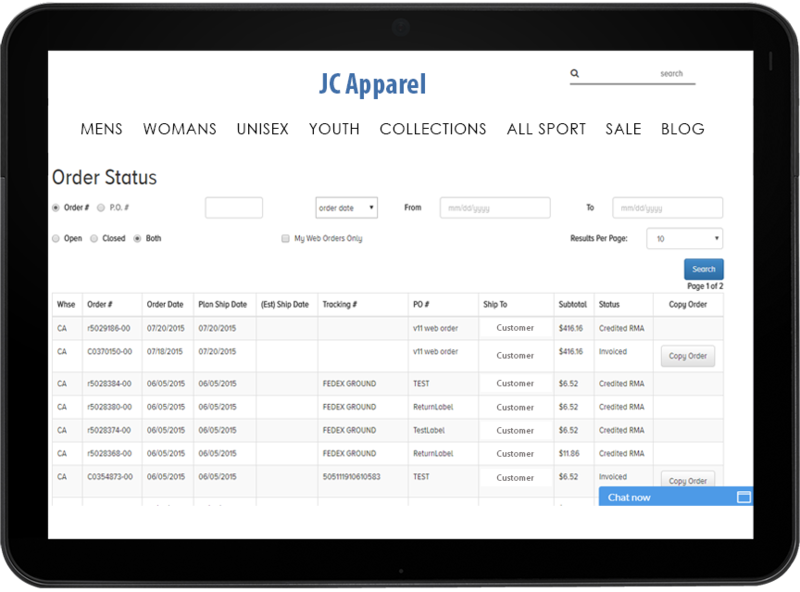 Such parameters consist of: percentages of the items, by product ID, Group Code, Vendor and/or any combination thereof. The system will then generate the tasks to move those materials that require quality assurance procedures. The rejected lots will be flagged in the system to avoid carrying out put-away and allocation tasks. Extensive Put-away Functionality enables the warehouse to utilize many different styles and methods of put-away techniques. Using the RF’s as the backbone of the put-away tasks, FDM4 Warehouse Logistics directs the users to the proper location, with the correct equipment, in the most efficient route and manner. All RF put-away transactions are confirmed with a location bar code scan to ensure Real Time inventory accuracy. 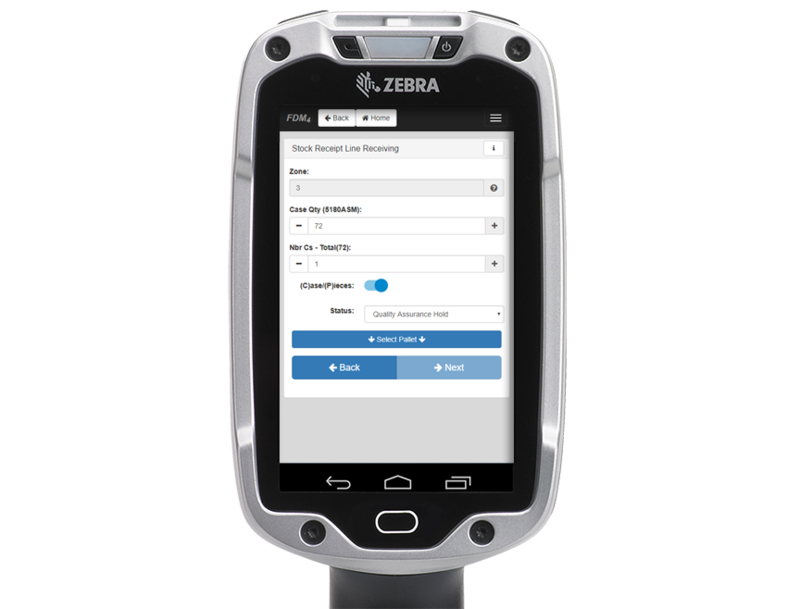 Based on user defined configuration, FDM4 Warehouse Logistics will generate the Put-away Tasks to most efficiently direct warehouse personnel to put items away based on the Item itself, the Product Group, the Locations, and/or any combination of the three. FDM4 Warehouse Logistics also incorporates Consolidation rules, and the Product and Location’s Dimensions (Cubing). The cubing functionality utilizes the product dimensions, weight and cube information to accurately ensure each location’s viability for put-away. 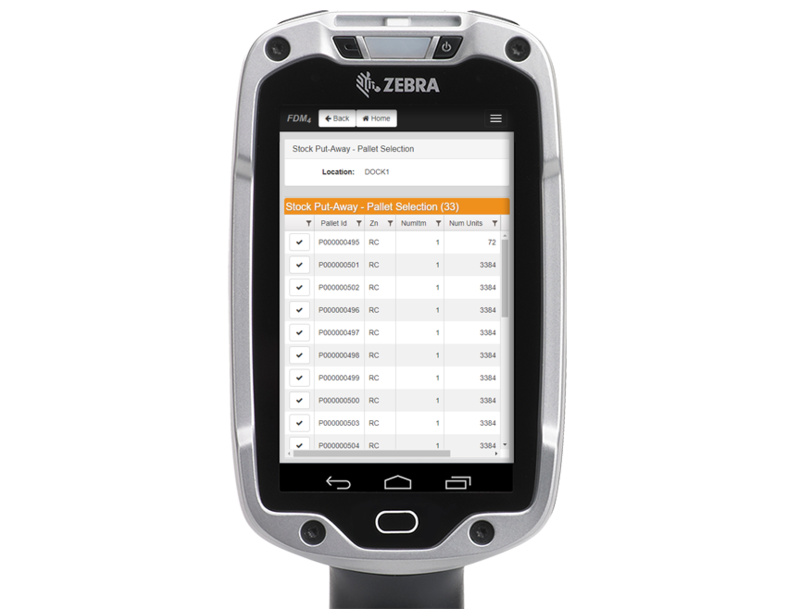 This will also prevent product damage by specifying item-specific or location-specific maximum load stacking parameters. Returns may be planned or unplanned. 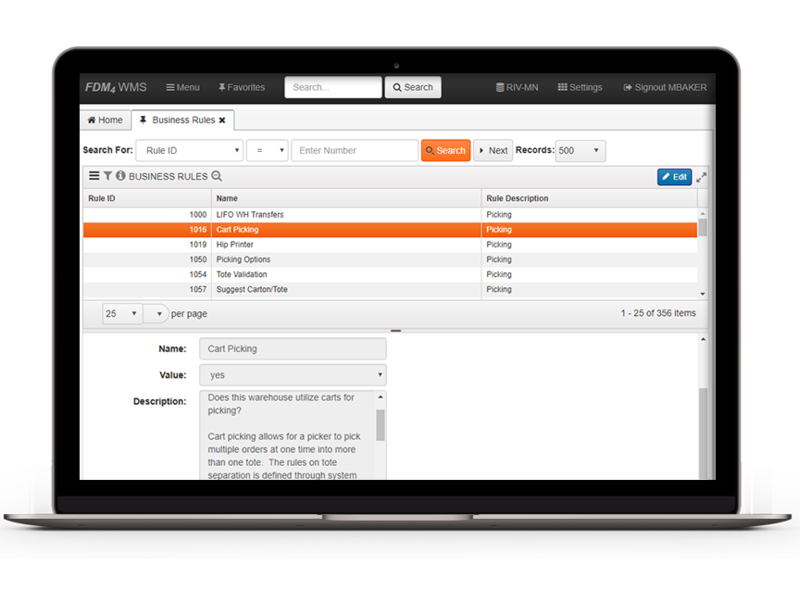 Planned returns come from the host system and are processed like normal receipts with the exception that the material is routed to the returns department. Unplanned returns simply show up at the door. There is no prior return authorization in the system. Unplanned returns are used primarily by mail order firms. 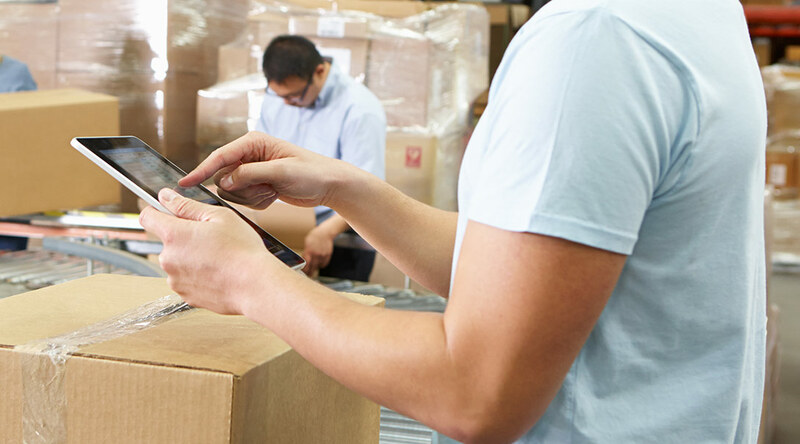 When merchandise that has been shipped is returned, FDM4 Warehouse Logistics provides a comprehensive three-step process to ensure the proper handling of the customer’s money and the returned merchandise.